Well, of all things… A typhoon that sneaks in right in the middle of the night: Pedring’s the name. Sounds a lot like the nickname of your favourite barber; not that of a howler capable of paralyzing a metropolis of millions. This was supposed to be an innocuous little weather disturbance that – if I remember correctly – was initially pegged with a 20% chance of becoming a tropical depression by a privately maintained weather web site that I frequently visit. As happens when a low pressure disturbance procrastinates over open oceans, it gathers strength and becomes a threat to those who fearfully await on land. To make things worse, ocean waters were warm the other week and, therefore, the very fuel that the erstwhile innocuous system needed to become a monster. 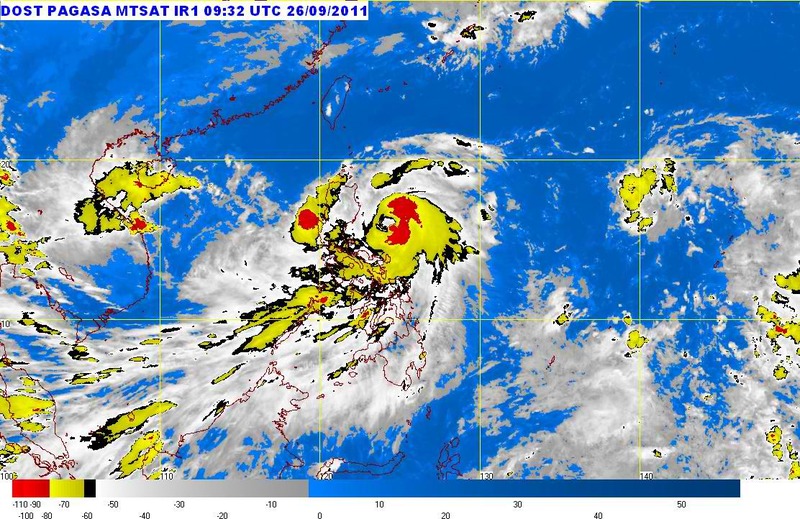 Soon, the weather disturbance was given a code name: 20W. If it was to intensify further – as it did – it was to become internationally called Nesat. If it entered the Philippine Area of Responsibility (PAR), well, there was a barber’s name waiting for it. Personally, I did not really think that the intensifying weather disturbance was anything to really worry about. It formed high enough above Saipan out in the South Pacific; and on a west-northwest track, it could be expected to merely skirt the northern fringes of the country. My only concern was if there was a high pressure ridge in Southern China to force it downwards; and there was none. Not that weather systems ever make it easy for those trying to figure out what they will do over a period of time. Last week, 20W a.k.a. Nesat started moving due west for a while; which alarmingly meant that there was an increased chance of it hitting the country. Forecast tracks were recalculated and new models showed it making landfall somewhere just north of Casiguran in Quezon. By Sunday night, and just a day and a half from projected landfall, I still did not think that the system’s wind speeds were all that remarkable. Signal number 3 at best, the forecasters said over the weekend news shows. I may sound blasé over this; but remember we have had Category 4 and 5 howlers with amazing regularity over the past five years. If I was worried at all, it was that the system – already baptized Pedring since it was by then well within the PAR – had a huge circulation. 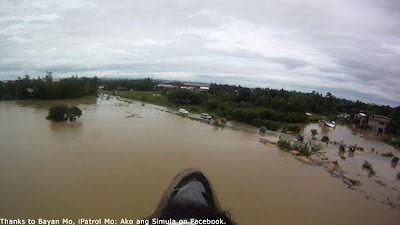 I knew just by looking at the satellite photos that even if it was to hit northern Luzon, we here in Batangas would not be spared by the rains. We were only under Signal Number 1 by Monday night; the power was still on; and if there were a few threatening gusts of wind, these were not very strong or sustained. Sometime in the middle of the night when I got up to pee, though, the winds were whistling menacingly outside. That was strange! The power had been cut; and this irritated me somewhat because I was certain that the typhoon was way north of us. I thought the power cooperative was being overly cautious. When I returned to bed to try to get back to sleep, I wondered, however, if Pedring made a sudden diabolical detour south. So, it went on till midday yesterday; the whistling of the wind, I mean. Curiously, although there were spurts of rain, these were never as hard as I feared. By mid-afternoon, I was even able to venture outside to sweep away the fallen leaves and twigs from off the driveway. Of course, the evening news shows – and thank God that the power came on late in the afternoon – showed others to be not so fortunate. Albeit, although I am tempted to thank God that I am in Batangas, I will not do so because being in the way of a rampaging typhoon is always something of a lottery. You just never know when you will be next. Knock on wood. 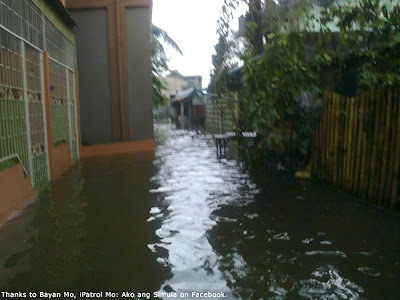 So, as could be expected, TV Patrol showed footage after footage of Pedring-related incidents: flooded streets, people being evacuated, uprooted trees and houses destroyed. I know we live in typhoon alley; but one just never gets numbed by looking at the destruction. I still get horrified each time. 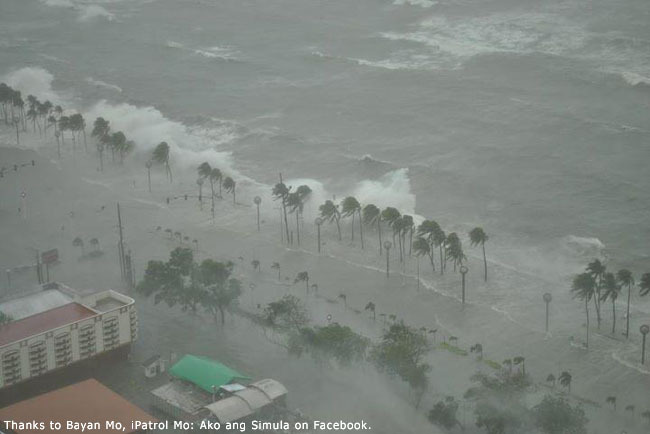 Of course, being Filipinos, there were those who went to Roxas Boulevard to have themselves photographed with the towering waves as backdrop. Well, at least this one did not raise my eyebrows. I mean, remember the military revolts against Tita Cory’s government? There were uzis following the soldiers as they engaged each other. You would have thought that people would run for cover when there were live bullets flying all over the place. How dangerous could 30-foot waves be in comparison? I dunno… Something is just not right about the weather these days. Storm surge: that, the PAGASA guy said last night, was the reason for the flooding in Manila. 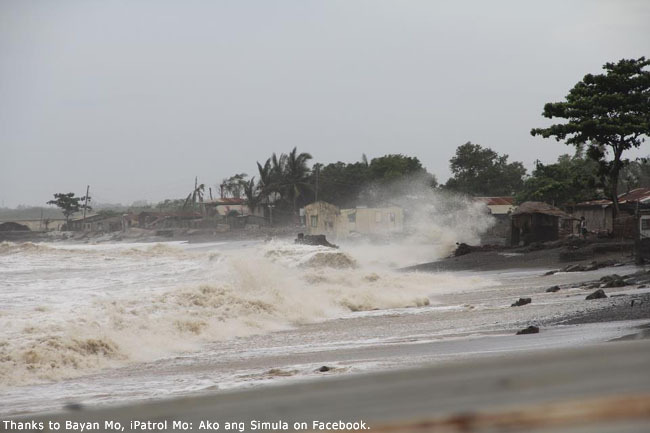 The typhoon, unfortunately, happened to arrive just as the tide was coming in. 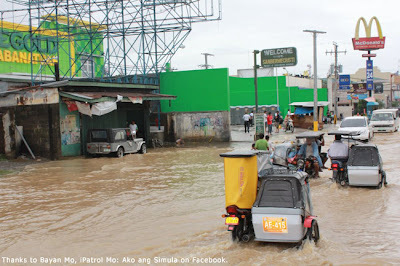 It’s the first time that storm surge had breached the sea wall of Roxas Boulevard, the weatherman started to say. Noticeably, he checked himself; my hunch was that he might have thought out loud but had not previously established his statement with historical data yet. 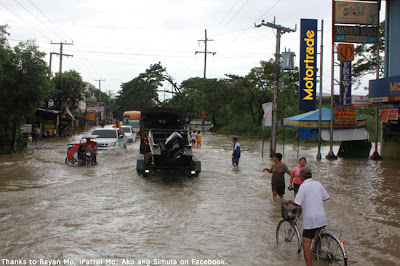 Seriously, does anyone remember storm surge flooding Manila? I mean, it’s the sort of thing you associate with the Gulf of Mexico or something. I have seen high waves on Manila Bay before; but the ones shown on TV last night were Hawaii Five-O stuff. There was even a tornado that ripped apart more than 20 houses in Iloilo yesterday while Pedring was crossing Luzon. Since this rainy season started, tornadoes have been happening with remarkable regularity. Don’t take my word for it. Go check Youtube. Maybe it is just that everyone has a cell phone with a video-camera these days. Where I’m coming from, tornadoes as a phenomenon occur as a matter of course in what is known as Tornado Alley in North America. Not in this country! Back to Pedring, it is now thankfully heading for the island of Hainan or thereabouts. Who wants to know? We have our own wounds to lick; and PAGASA likes to tell us that there are still – statistically, at least – a few more coming before the year is over. Not that I expect many of our countrymen to be really fazed. Already, with Pedring just barely out of the country, a few have already found ways to make us all laugh despite all the destruction. 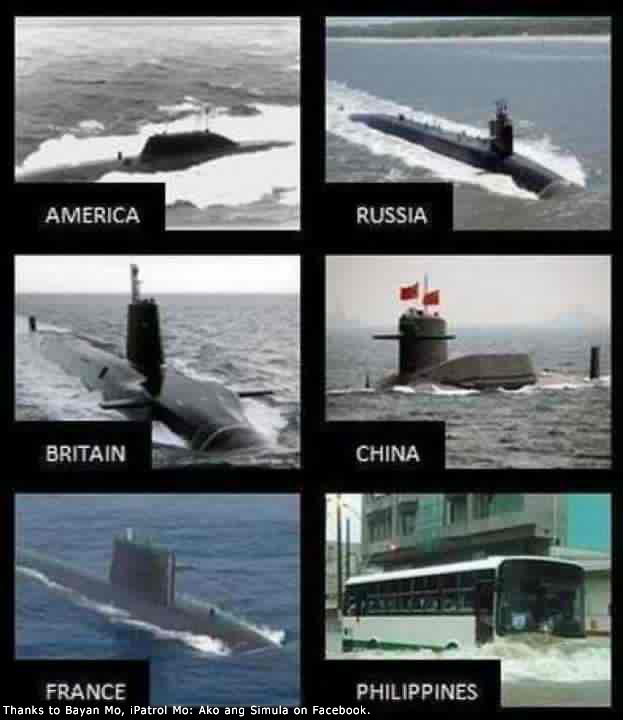 Just being Filipino, I guess.